The Clemson Tigers are 9-1 and the ACC Atlantic is wrapped up. They are coming off of an emotional win after a game-winning field goal as time expired. There is a nationally-relevant rivalry game looming in eight days. The ACC Championship game is just over two weeks away. A 5-5 opponent is fighting for its bowl eligibility. The Wolfpack is celebrating Homecoming and is playing with a sense of urgency after losing to last place Boston College. What do all of these ingredients have in common? They are the perfect recipe for a trap game. The division title is firmly in hand and the rivalry game with South Carolina looms a week later, and their second trip to the ACC Championship game is in 15 days. The N.C. State Wolfpack; however, have everything left to play for. After losing to Boston College last week, they must now win their remaining two games in order to become bowl eligible. Here’s how the menu sets up for No. 7 Clemson at N.C. State in Raleigh, N.C. at 3:30pm EST. The Russell Wilson era ended in Raleigh over the summer after head coach Tom O’Brien granted him a release to go play professional baseball. After the baseball experiment failed, Wilson decided to transfer to Wisconsin where up until a couple of weeks ago, he was having a Heisman-worthy year. Enter Mike Glennon- the 6-6 senior quarterback who is leading the Pack offense. Glennon has thrown for 20 touchdowns and 10 interceptions this season. The Pack rely heavily on Glennon’s rocket of an arm because their running game, or lack thereof, has caused them to be very one dimensional over the last three games. Wide Receiver T.J. Graham is the speedy, downfield threat that Glennon will be looking for throughout the day. Graham has 31 catches for 553 yard and five touchdowns. The N.C. State running game has been inept all season long and is ranked 111th in country averaging 102 yards per game. The Pack will try to run the ball especially since teams have had success against the Tigers on the ground this season. 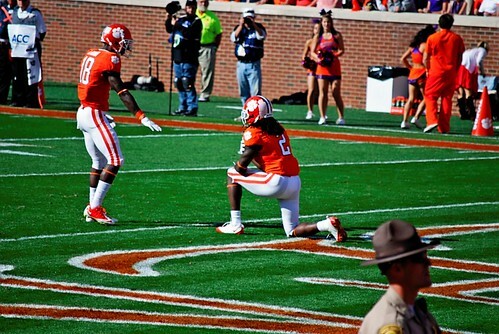 The question that everyone has been asking this week is, will Sammy Watkins play? The answer - that decision won’t be made until game time. If Tajh Boyd and the Clemson offense can limit the turnovers and go back to playing disciplined football instead of trying to go 70-yards on every play, Watkins can rest his shoulder and get ready for his first Gamecock encounter. Offensive coordinator Chad Morris said this week that Boyd needs to be patient and remember his checkdowns instead of forcing the ball down field. If he will throw to his checkdown receivers and if the Tigers can get their running game going again, it could be a long day for the Pack. Clemson has committed seven turnovers in the last two games. This plays right into the hands of the N.C. State defense who ranks sixth nationally with 27 takeaways. Corner David Amerson has ten interceptions on the year and looks to set an ACC record if he can get to 11 by the end of the season. The Pack have playmakers on the defense, but they may not have enough to keep the Clemson offense tied down the entire game. If the trend of defenses dropping seven or eight men into coverage continues this week, Boyd needs to remember his ever so reliable tight ends Dwayne Allen and Brand Ford to be open on the short passing routes over the middle. With or without Watkins, the Tigers have plenty of talent at both running back and wide receiver to stretch the field. The Tigers haven’t played a team with a true threat in the punt or kickoff return game since the UNC game, where T.J. Thorpe took a kickoff 100 yards for the touchdown. This week, it’s another TJ - TJ Graham who averages just under 13 yards per punt return. Pack kicker Niklas Sade is just 12-for-17 on field goals and has only made four of his last eight attempts. This is the third time this season that Clemson has been a team’s homecoming - Maryland and Georgia Tech are the other two. The Pack comes home after a humiliating loss in Chestnut Hill, MA last week and is looking for redemption and the doctor has ordered a win over a top-ten ranked team to cure their ailments. The Pack have enough playmakers on both sides of the ball to make this a game, but this group of Tigers refuses to give up and won’t be intimated by anything or anyone. Look for this to be a typical 2011 Clemson game - a slow start and close in the third quarter with the Tigers pulling away in the fourth. This post was written by Clemson Girl sports blogger, Nikki Steele.